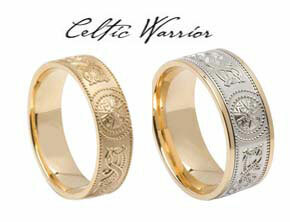 Boru Jewelry has created the Celtic Warrior Shield collection that recreates the past and reflects contemporary fashion. The bands in the Collection reflect the four seasons, the movement of the Sun and the effect the pagan snake god Crom had on Christianity in Ireland. It is amazing how a small piece of jewelry can tell such a big story. The Celtic Warrior collection was inspired by the Ardagh Chalice which can currently be seen in the National History Museum of Ireland in Dublin. The Ardagh Chalice, as well as the Book of Kells, is internationally recognized as a priceless antiquity and a treasure of the people of Ireland. The Ardagh Chalice is from the early Christian Period and is believed to have been made in the late 8th to early 9th Century. Not breaking with ancient skills and traditions, Boru Jewelry has designed the Celtic Warrior jewelry collection for you to enjoy today.